The chunky greens and juicy prawns make this a filling dish, while the curry paste and vinegar add layers of flavour. 2. Meanwhile, place the stock, vinegar, soy sauce, sugar and curry paste in a large saucepan and bring to a simmer. 3. 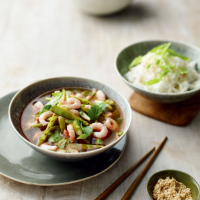 Stir the prawns and mangetout into the pan and cook for 2–3 minutes until piping hot. Ladle into 4 bowls and scatter over the coriander leaves and most of the salad onions. Divide the rice between side bowls, scatter over the sesame seeds and the remaining green slices of salad onion, and serve alongside the soup. Cook’s tipTry adding sliced fresh red chillies for extra spice and heat.